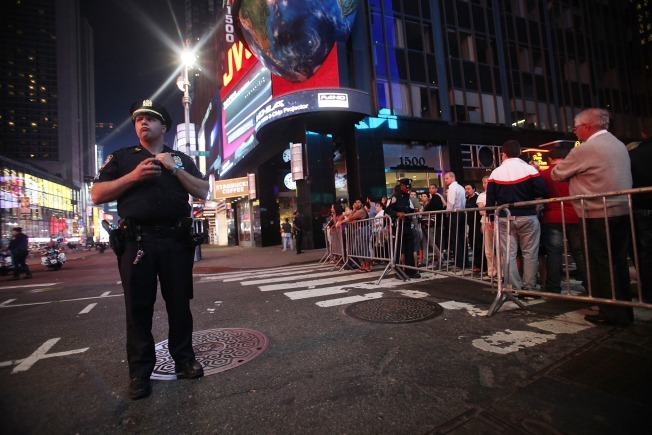 Police keep watch in Times Square after an incident involving a suspicious vehicle caused authorities to shut down parts of Times Square May 1, 2010 in New York City. Both vehicular and pedestrian traffic has been diverted from the area, reportedly causing the cancelation of at least one Broadway show in the area. New York CityMayor Michael Bloomberg and NYPD Police Commissioner Ray Kelly are on their way back from the White House Correspondents Dinner and will be briefed at the scene of that bomb scare in Times Square. Police said Saturday the bomb squad was investigating the contents of the car on 45th Street. They say the block was closed between Seventh and Eighth Avenues as a precaution. A webcam at 46th Street and Broadway showed the streets had been cleared of pedestrians. A line of police cars blocked one street. Police say a call of a car fire came in about 6:30 p.m.
police robot examined the vehicle. Clothes, racks and scarves were found inside.